Home » Rural » CASE #7 : I CAN’T BREATHE! CASE #7 : I CAN’T BREATHE! This case is inspired by listening to the RAGE podcast #2 – if you haven’t already listened, do so ASAP (download from iTunes) or click here. RAGE = Resuscitationists Awesome Guide to Everything and is a nice 60 min or so podcast full of clinical pearls. Rural doctors may be wondering what relevance this has for them? Experienced rural docs know that ‘critical illness does not respect geography’ and it pays to be aware of useful tips and pearls. The setting, as always, is a small rural ED in Australia. Transfer times are 60 mins by rotary wing, 2 hours by fixed wing (airstrip is remote from clinic and requires ambulance transfer by volunteer crews). Facilities include small resus bay with point-of-care INR, proBNP and Chem 4/Chem 8 iStat, CXR (but you have to take the radiograph yourself), and the usual resus drugs, 2 lead ECG, telemetry, adrenaline as sole inotrope etc. There’s an old Oxylog 2000 plus transport ventilator. There is also an old SonoSite Titan ultrasound unit with linear and curvilinear transducers. Nearest CT scanner is 300 km away. A 54 yo obese patient presents complaining of acute shortness of breath, approx 2 hours duration. She complains of pain on inspiration and feels unwell. She denies prodromal symptoms such as fever, chills, sputum. She is a smoker, on HRT and tells you that she flew in from London 5 days ago. Q1 : What are possible causes of her acute dyspnoea? What key features on history and examination will help you decide? Q2 : What are appropriate & available tests that may guide your management? 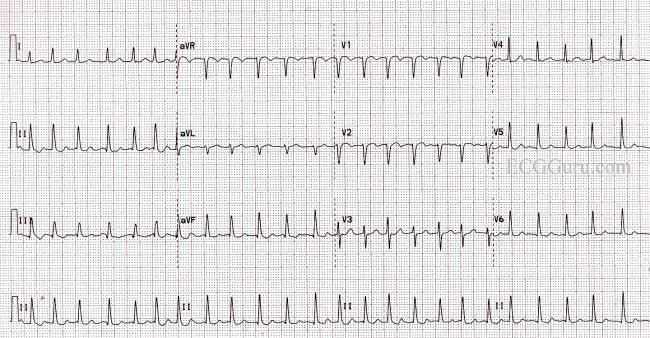 Q3 : Her ECG is as below. What does it show and what are your options? Q4 : 30 mins later her SBP drops to 88/50 and remains so despite 2 x 250ml fluid load. HR 123 a/fib. Spo2 94% 15l via NRB. Apyrexic. If so, what criteria or other tests would guide you? By Http://about.me/timleeuwenburg in Rural on January 22, 2014 . Thrombolytics would NOT be my first step. …of course O2, IV access. No consolidation, wheeze, HS dual, pCXR normal. Nil oedema, Belly soft nontender. Then she drops her bundle – worsening haemodynamic instability. Gonna be a while before can get her to tertiary centre..
1) #1 is PE, after that ihd and mi? And chf. Infection less likely with sudden onset, ? Pericarditis?? Pin down the hx. How sudden was the onset. Cough ? Haemoptysis. Leg swelling? Orthopnoea etc. past hx of all of the above? Previous PE . So far looks and quacks like a PE . 2) tests . Uss legs for DVT, moderate level of confidence doing this. CXR if I think it’s doable. Uss over chest wall to exclude pneumothorax. / check for cardiac tamponade while there. Her neck veins are probably too well hidden to see. 4) I would have a big medico legal worry with thrombolysis, but if she is getting worse would be on the phone to our retrieval center to spread the blame :). DVT on uss, and a good hx like this may convince me, would use the standard thrombolysis exclusion criteria from mi rx. While I’m waiting , I’d be throwing some clexane into the mix if I’m happy we don’t have a bleed as a cause. Having said all this, I’m one of the few lucky rural docs with a ct 15 meters from Ed, and a high speed link to upload for rapid reporting 24 hours a day, so if I was at home would be ct and treat from there. You lucky bugger – rural AND a CT. Is Cooma that far from Canberra? Oh yeah…ski fields!